Red traffic light stops suspect in his tracks. ‘Die, thief!’ The suspect was brought back to the scene of the alleged crime for more punishment. A MAN was attacked by a mob in Braamfontein after it was alleged that he had stolen a parked vehicle outside the construction site opposite the Wits Art Museum (WAM) on Thursday morning, January 31. A Wits Campus Protection Service security guard at WAM who asked not to be named, said he had witnessed the crime and so did numerous construction workers. 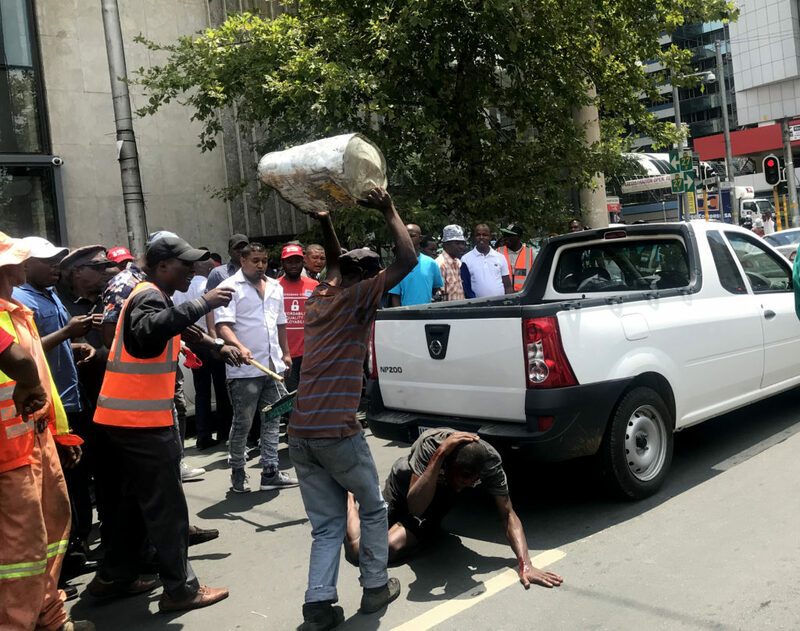 The suspect allegedly got into a white Nissan NP200 which was parked outside the South Point construction site at the corner of Jorissen and Bertha streets, while the owner was delivering documents to the site manager, and drove off. “[The construction workers] together with the owner, became hysterical. They saw him from above and they started screaming,” he told Wits Vuvuzela. The screams were heard by passers-by who saw the suspect driving off in the vehicle. “The traffic lights closed and he (suspect) drove into an Uber. He then got out of the stationary car and ran away,” the security guard said. Spokesperson for the Hillbrow Police Station, detective Mduduzi Zondo, confirmed that a case of attempted theft had been opened. “The owner was alerted by bystanders who saw the attempted vehicle robbery at around 11:00 and told him people were trying to steal his vehicle,” he said. “There were three suspects all in all. Two were in a getaway car, a maroon [Renault] Clio. We are investigating and following leads that will lead us to the other two being arrested,” said Zondo. The 43-year-old suspect was seen fleeing the scene by Wits Vuvuzela and running towards De Korte Street with a large crowd of people pursuing him. Moments later, the man was brought back to the scene of the alleged crime by the crowd. He was bleeding from the head, arms and legs from the blows of the pursuers. “This beating is not enough. Pour petrol on him so we can burn him,” shouted some in the mob. The beating continued outside WAM for some time until the police arrived some 30 minutes later, apprehended him and took him to the Hillbrow Clinic.